PA Chairman Abbas indicates he would be willing to return to the negotiating table with Israel after 'Palestine' is recognized by the UN. Palestinian Authority Chairman Mahmoud Abbas met Tuesday in Ramallah with representatives of EU countries in the Palestinian Authority and discussed with them the regional situation following the Arab spring and the PA’s position towards the peace process with Israel. Abbas told the European representatives that the PA is ready to resume negotiations with Israel on the basis of the EU’s official positions. He noted that the PA will make use of these EU positions when it submits its recognition to the United Nations General Assembly. He also stressed that the PA’s unilateral statehood bid to the UN does not mean eliminating the option of negotiations with Israel, but is rather a complementary measure designed to preserve the two-state solution. He claimed that Israel’s continued construction of Jewish communities in Judea, Samaria and Jerusalem may bring an end to the option of a two-state solution. “Once we receive the recognition of the UN General Assembly we will be ready to return to the negotiating table with the Israeli side to discuss any issues related to the final settlement," Abbas told the representatives. Several weeks ago Abbas formally announced that the PA would ask the General Assembly to grant it "super-observer" status that could give it access to UN institutions and agencies. 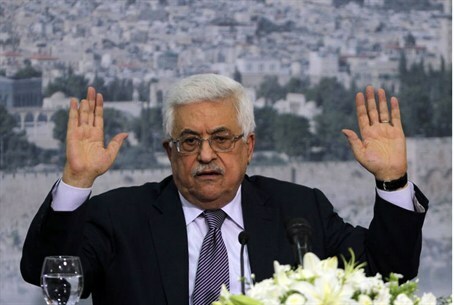 The announcement, made in his address to the General Assembly, came a year after Abbas asked the Security Council to grant the PA full member status. That bid has failed due to a lack of support in the 15-member Security Council. This time around, it has been predicted that a unilateral PA bid for statehood recognition in the UN General Assembly could win 130-140 votes should the motion be put forward, securing a majority. The PA plans to submit its resolution seeking enhanced UN observer status for ‘Palestine’ after the U.S. presidential election on November 6.